Lanyards have become very popular in the recent years and have now mostly replaced other forms of employee identifications. While some companies still use uniforms and name tags, many have moved over to lanyards because their employees prefer them. At Ezy Lanyards, we have a large collection of products that can fit all kinds of budget and preferences. Here’s a list of 12 products we offer and a brief explanation about them. You can consult with our customer care representative if you want to know more. Bootlace printed lanyards look like a bootlace with the name or logo of your company printed on it. The lanyard comes in many different colours and is made of easily washable and resilient material. We offer black, green, grey, light blue, pink, navy blue, red, purple, white, royal blue, and yellow lanyards colours so you have many options to choose from. Faux leather lanyards are durable, resilient, and look luxurious. They’re great for outdoor employees because they won’t get damaged easily by the weather. We offer black, brown, and white options but you can print any colour of the logo or text on the strap. Our nylon lanyards are durable and affordable, which makes them an excellent choice for bulk orders. They’re available in a wide range of colours like black, blue, green, pink, orange, purple, red, silver, yellow, and white. You can also print any colour you want on the strap. We suggest you choose contrasting colours for the best effect. The polyester ribbed lanyards are highly-visible and noticeable. They’re also very bright and colourful so these lanyards are ideal for casual environments. For example, if you’re a start-up with a staff full of youthful and energetic people, you would need lanyards that would suit the atmosphere and these polyester ribbed ones do just that. 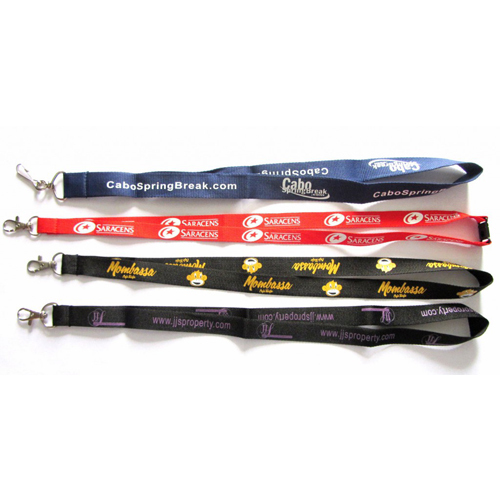 The polyester with PVC strip lanyard is ideal for brands want a more distinctive and durable band. This lanyard is made primarily of polyester but a small portion of it has a PVC strip. We will print your company name or logo on this strip. This lanyard is also available in different colours, including black, green, blue, orange, purple, pink, red, silver, white, and yellow. We also have other materials like PVC, polyester with satin, recycled pet, satin, sublimation, woven, and woven rope. These bands are also available in different colours and will showcase your logo and company name well. As an Australian owned and operated company, the quality of our lanyards is excellent. Our products are durable and well-crafted. We deliver Australia wide if you order a minimum of 100 pieces. Have any questions about lanyards or want to place an order? Get in touch with us at Ezy Lanyards through this contact us form. We’re also available on the phone so give us a call on 1300 753 675 and we’ll be happy to help.